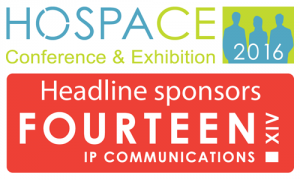 Fourteen IP are delighted to once again be a major sponsor of HOSPACE conference and exhibition being held this year on November 10th at the Sofitel Hotel at London’s Heathrow Airport. HOSPACE is a one-day annual conference and exhibition hosted by HOSPA which is the UK’s leading educational organisation for Professionals involved in Financial Management, Revenue Management and IT within the hospitality industry. Amongst the issues being discussed at this year’s conference is the impact of leaving the EU on the UK hospitality industry and the profession’s influence on the rest of Europe. As well as being a headline sponsor Fourteen IP in partnership with Aruba will also provide WiFi for the conference fronted by our own Evolution Gateway solution. We look forward to seeing you at HOSPACE. Visit www.hospace.net for more information and if you watch the video on the homepage, see if you can spot our very own Neil Tolley at about 30s into the video. Click here to download the HOSPA infographic about the event.